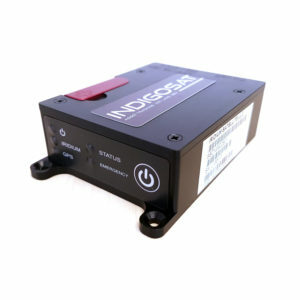 The Indigo Stealth system provides you with a semi-portable tracking solution for your aircraft. The Stealth can be moved between aircraft should the need arise. The Stealth makes use of two small patch antenna, one for GPS and the other for satellite communication, utilizing Iridium's short burst data (SBD) service to provide location information determined by a GPS receiver back to the software platform (MiTrac). These two antenna can be placed on the glare shield without obstructing the pilots view in any way. The Stealth can be powered from an existing cigarette light type socket, and auxillary power socket, or an external battery should a power socket not be available in the aircraft. The Stealth can be set to require the user to power up the device manually of can automatically power up when power is available via the power source.